When I lived in Italy I was both very lucky to know a few Italians who treated me like family, and very naive. I think back now on my 6 months living in Italy and I can’t help but realize how much I missed. What I really needed was a friend like Viola to help me navigate and find the good stuff. 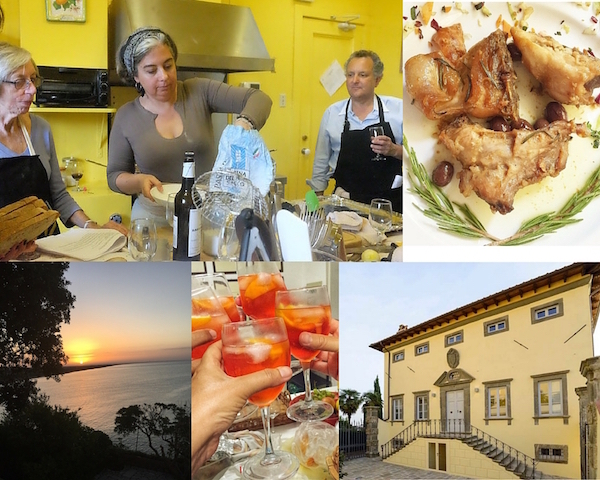 Viola Buitoni is a San Francisco cooking instructor and kind of impresario--organizing Italian themed events. She’s also tremendously down-to-earth, relaxed and utterly charming. I took a cooking class with her a few years ago and loved every minute of it. Her classes sell out so quickly I rarely have time to write about them in advance. To travel with her to Italy? That sounds like heaven to me. Where did you grow up and can you tell me about your family’s food connections? VB: I grew up in Perugia, the main city of Umbria and was born into one of Italy's first pasta families. I am the 6th generation of the Buitoni family. Our pasta fortune originates in Sansepolcro, a province of Arezzo. Shortly after moving to Perugia to mind one of the pastifici, my great grandfather Francesco founded Perugina with Luisa Spagnoli. Though my family no longer has a stake, Buitoni and Perugina are both worldwide food brands to this day. What made you decide to run tours to Italy? VB:I've been in the Italian food business for more than 25 years, I've run kitchens and dining rooms catered to the NY elite and even owned a store. After a short maternity break, I started teaching and found enormous joy in sharing the knowledge I had accumulated. My deep love and understanding of Italian food was clearly infectious. I've grown a following of students who often told me I've changed the way they think about food. Guiding a cooking experience in Italy seemed a natural extension of the "Viola experience", so to say, a way to continue to inspire passionate home cooks even further in embracing not only the technique but the deeper meaning of food and kitchen culture in Italy. What kinds of recipes do you to teach? VB: I teach recipes that can live and change in home kitchens and that are suited for school nights; the kind that that can work for generations and create lasting memories while changing with time. My food is very market driven, it is a celebration of where and when I am in different places in the world. Always, of course, with an Italian sensibility. Why are your trips to Lucca and Maremma instead of to the more well-known cities like Florence or Perugia? VB:The simple answer is I have access to unique and well suited facilities, but there is more. My maternal family has summered in Maremma for 6 decades, so I know and love it intimately. Lucca came on the coat tails of Maremma when a local foundation noticed the work I was doing and proposed that I do something similar in the lucchesia. There is also the desire to share Italy as I know it and love it, with all its fables, and all its foibles. An Italy that is for locals, that runs on the timetable of nature and its seasons. Teaching about food is also generating emotions, opening a door into an upbringing and adulthood that have always been deeply connected to the pathways of producing, purveying, cooking and enjoying good food. I can think of no better place to do this than the less known territories of Italy. What are some of the highlights of your tours to Italy? VB:In Maremma a private dinner on top of a mountain from which you can see forever, a visit to the winery of a family. A friend who watched me grow up. In Lucca cooking classes straight from markets, a private tour of a villa guided by the princess who owns it, followed by a reception in her private loggia.